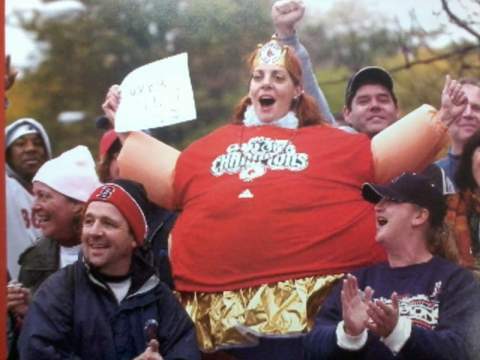 PawSox Heavy: The woman on the last page. The woman on the last page. The book was called Something Something Fat Lady, so I see why they closed with this shot. This picture comes from the 2004 World Champion Boston Red Sox Rolling Rally Parade Explosion Party Featuring Euclides Rojas and Pokey Reese. But I didn't need to read the caption to tell me that, because this woman WAS DIRECTLY ACROSS FROM ME ON THE BRIDGE NEAR THE SCIENCE MUSEUM!!! And she was awesome and unforgettable in her fat suit! Crazy to think that was eight years ago. I slept over in Boston that night and woke up before the sun to stake out a spot on the route and I sure got a good one, even though it was at the tail end. And I never forgot Miss Fat Lady across from me. REMEMBER? They had a map of the parade route and then they decided to extend it due to massive interest! Anyone, this woman's name is Laura Lavallee so if you know her please thank her for me. I am liking her already. That is one true fan who makes a commotion to cheer up a very gloomy season ahead. I like her spirit. Kevin Youkilis was on the Pawtucket Red Sox.